*sigh* I do completely agree with you, I've always been a proponent of having things on a character sheet that reflect fluff even if it doesn't necessarily help gameplay. Unfortunately 3rd edition M&M puts me in a difficult position in terms of reflecting that in abilities and still getting what I'm looking for in characters. Skills I can still manage to practice what I'm preaching, but abilities is trickier as 3rd edition has generally made abilities an even worse investment when trying to get the characters you want (and don't get me wrong I love 3rd ed. but I'd be lying if I said it didn't have its problems). There's the rare character like Crystal who I can get away with presence thanks to presence-based expertise's, but dexterity really got shafted and its only use became fueling three disparate skills. Whereas agility still manages to fuel a defense, initiative, and two skills. Admittedly that can still be chalked up to sheet-making habits I can't bring myself to get over. That said fighting I'm not certain I see what you're talking about, fighting I almost never neglect - I think the only one I dropped fighting for completely was Black Swan and that's because her backstory included no particular inclination towards fighting, she had to be expressly trained by Blue Jay, and that was focused on unarmed combat to take advantage of her suit's enhanced strength. odettes black swan was the primary target fo the fighting critique. namely that I cant see how someone trained by a person with a fighting of 7 which is clearly low superhuman levels of skill per the base rules doesn't train his sidekick in the types of fighting needed to aquire at least a 4 a professional level of skill trained soldiers and the like have. I think its partly my own martial training kicking in where you learn unarmed of course but as you train and grow experienced you pick up all sort of other skills broadening the skill base hence the over all fighting skill. as well as teaching her how to defend better which is a part of the fighting attribute. No promises on how often I update this, but I've decided I'm going to take another stab at my old "Justice League 63" take. As sort of a compass for me personally I'm going to go ahead and outline my rough guidelines. Power Level will equal their Justice League counterpart as listed in the DC Adventures book. Point total will be the same as a starting character at the individual character's power level. These will not be opposite gender rehashes of the characters they are based on, but their stories and builds will have comparable themes and similarities. I will also attempt to break my habit regarding abilities where appropriate. And lastly, which almost goes without saying, they must be the opposite gender of the Justice League character they are based on. Whatever stories I construct for these guys will be based on a hypothetical world, but I haven't decided how vague I want to be on them as if I'm putting in the effort on these characters I'd like to use them in a game some day after all. So... whenever I so have the time and inclination, we'll start with the Superman parallel. No Martian Manhunter or Aquaman? Aquaman is on my list up there. But no plans for Martian Manhunter right now, I personally am not fond of the character, possessing a wider array of disparate powers (hell even Superman's powers are more unified) that are all at mind-boggling scale doesn't interest me; and unlike Superman his personality never did enough for me to look past that (and it probably doesn't help that writers can't settle on ANYTHING throughout the character's history), though in fairness this antipathy extends to pretty much every DC comics martian (though Miss Martian is more interesting for being the type to combat her inborn instincts). Who knows though, I might change my mind, after all this side project isn't about creating exact copies. My apologies about missing Aquaman. I promised it and now she's finally here! So what makes Superman, well, Superman? Sure that cape and icon are almost instantly recognizable, and everyone knows how nigh-invincible he is; but those are not what he's about (as I wish I could tell my high-school self who always grumbled about how overpowered he was). Well when I actually saw the "World of Cardboard" speech and later Superman vs. the Elite and I woke up to what really makes the Man of Steel; here he is, an alien who appears almost godlike to us Earthlings, someone whose power is so great and easily abused since few to none could stop him if he so chose... and he doesn't. For all his power he's just here to watch over mankind and give them a hand when he can, because mankind is his adopted species since his native Kryptonians are, effectively, no more. Some could call him an outsider, but he has truly made Earth and man his beloved home and family. Superman isn't "super" because he's super strong, he's super because he's strong enough not to abuse that power, and strong enough to without shame or irony, show that he cares. So in designing a woman based on him I first had to pick a name. 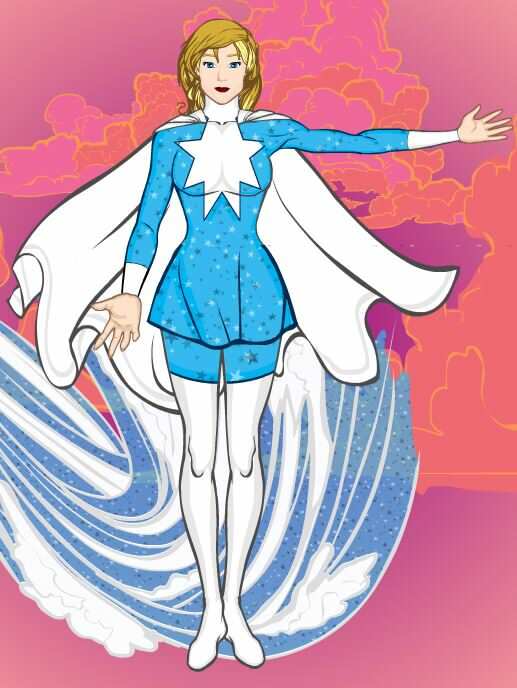 Superwoman didn't work, felt like I was flagrantly ripping him off like that, so after consulting a thesaurus for a good half an hour I finally found a good name: Grace. Grace means a whole lot of things as a noun, a verb, and an adjective, and my vision for Grace would encompass a good number of those characteristics. Next was costume. I decided on white and blue since those are seen as pure and peaceful colors respectively, and to avoid just staring at plain color threw in some stars. I flip-flopped on the cape for a bit but decided to go with it, as it carries a certain amount of presence with it. As for being completely without a mask, I realized that Superman was actually onto something by being, while handsome, relatively nondescript - and more importantly, the lack of a mask made it seem like he had nothing to hide, inviting others to trust him; and it certainly seems to work. For the duration of this project I've elected to keep the backstories vague for now. But I feel the important part of Grace's backstory is simply that she also had a good influence in her life nudging her in the right direction, and inspiring her to be the best she can be. Kinetic Power: A large portion of Grace's power comes from being able to control incredible amounts of kinetic energy within her own body. Kinetic Strength: [Physical] [Kinetic] By default Grace's powers enhance her strength to incredible superhuman levels. Kinetic Vision: [Kinetic] [Energy] Grace is able to expel kinetic energy from her eyes in a brilliant blue light! She's a very precise shot with this power. Kinetic Breath: [Kinetic] [Air] By using kinetic energy to amplify the power of her lungs Grace can inhale or exhale powerful gusts of wind! Superhuman Immunities: [Biological] Grace's superhuman body is immune to many concerns of a normal human body. Invulnerable: [Physical] Grace is nigh invulnerable, requiring a considerable amount of force to even injure her. Flying: [Movement] [Kinetic] Using her kinetic energy to propel herself through the air Grace is capable of flying 2,000 mph! Alt; Super-Speed: [Physical] [Movement] [Speed] [Kinetic] Grace is also capable of running at high speeds. When not focused on flying that concentration allows her to accomplish routine tasks in a fraction of the time it would take someone else. Super-senses: [Senses] [Vision] [Hearing] Grace's vision and hearing are able to pick up details from considerably further away than others. Motivation - Doing Good: Grace strongly believes in helping those in need, stopping others from committing evil, and hoping for a better day tomorrow. Responsibility: Though her powers help with the paperwork and reading, being a professor still requires she teach classes and ensure her students are taken care of. Secret Identity: Ellen Evans, a professor at [Name here]. When Ellen turned thirteen she discovered that she possessed superpowers. Eventually her mother told her the truth, that both she and Grace's father were part of an experiment to create a powerful superhuman. However they both loved Ellen too much to let her be some test subject and arranged for her escape. Her father disappeared to throw off pursuers, and he hadn't been seen since. Though hurt that this was kept from her all her life, Ellen found new hope that he was still out there somewhere. Her parents believed in the promise she held, and so vowed to live up to that promise. Taking on the identity of Grace, she became one of the world's foremost superheroes. Last edited by Nintendogeek01; 07-27-2017 at 02:08 PM. Superman isn't "super" because he's super strong, he's super because he's strong enough not to abuse that power, and strong enough to without shame or irony, show that he cares. This. Exactly this. What so many Supermanalogues lack. But not this one. Grace looks excellent. We covered the cape, now we cover the cowl. Whereas Superman is the bright promise of a better tomorrow, Batman is the danger in the shadows that serves as a warning against doing any wrong. Laymen know that the DC 'verse is filled to the brim with superbeings who could sneeze the planet into space dust, and yet Batman sticks out for being the one guy in the Justice League's inner circle who is "only" human. While Batman being human is one of the main selling points of his character that make him more relateable than the average superhero it is a mistake to consider Batman "only" human. Over the years different writers have made Batman stand out in several ways, partly out of necessity to ensure readers aren't left scratching their heads wondering what Batman is left to do in the League, they emphasized his overall darker worldview, his intellect, and most of all his dedication that leaves him the League's go-to guy for when they need a plan. Yet even as his competence zones away from what's feasible for some people he still remains fascinating to us for the psychological edge he and his gallery of characters have in spades. To this day we are still hooked to this man and how he had coped, in both good and bad ways, with one of most terrible tragedies imaginable for a young boy to go through; though many have rightfully noted that his obsession has left him with few stable relationships and emotional baggage that he often finds himself unable to deal with Batman is still one of the most admirable heroes in comics because where some would've been left forever victimized by that tragedy, he instead chose to fight back against senseless crime, take control of his own destiny, and do what he can to keep others from his same suffering; all with the help of his skills, gadgets, allies, iron-clad morals, and most of all his dedication. So if there was one thing more nigh-impossible than trying to summarize Batman in a single paragraph, it was making a woman based on him under the rules I'd written for myself a few posts ago. I was sorely tempted more than once to break my point-limit and abilities rule, but still in a way it did force me to sit down and analyze. Batman has used many tools, both physical and mental - gadgets, stealth, martial arts, escape artistry, detective work, but ultimately I think there are two things that are absolutely vital to Batman's methodology - fear, and the ability to plan ahead. Batman uses fear to scare criminals from their dirty deeds and maintain an edge over Gotham's criminal element, so regardless of where I had to start cutting corners I needed to capture fear. After browsing nocturnal creatures I went with the (admittedly overdone for the sake of Batmanalogues) owl. Main reason for the owl was it gave me the chance to design a look that would have a distinctive silhouette, the same way Batman's own shadow immediately causes criminals to jump and gasp. After struggling with what to tack to the owl moniker (Barn Owl, Horn Owl, Hawk Owl) I eventually gave up on direct owl species' reference and went with a different noun; Agent Owl. Not to say she's a part of an agency, but rather Agent in relating to the concept of agency, the power to make a choice and affect your own life. As for the ability to plan ahead, well that's where her technology and inventor skill come in (and to a lesser extent Jack-of-all-trades); inventor has a not undeserved reputation in the M&M community for being abused (Down with quickness + inventor builds!!! ), and some newer players I've noticed tend to look to that advantage and think to get a solution to all their problems before they realize how time-intensive inventor is. But the time-intensity and versatility is precisely why I consider inventor to be more about planning ahead and being ready for the worst. One note about the build: It's admittedly pushing the limits of what I'd call equipment. Whenever I run games I usually tell people to show me an example, but I typically let direct effect equipment to have around five ranks in whatever it is they do. Pushing some of the effects to six ranks but with a drawback (in this case stronger equipment getting less range, boomerangs excepted since their damage is strength-based) I think would still be acceptable, but if this were PL or two higher, Agent Owl probably would've been a device character rather than an equipment one. Agent Owl has no superhuman powers. She has trained herself to be in top physical condition and is a master combatant, capable in hand-to-hand and armed combat. Owl's high intelligence and aptitude allows her to equal or exceed professionals in several fields, but most important to her mission against crime Agent Owl has learned to utilize stealth and scare tactics to terrify criminals and serve as warning that they cannot just do as they please. She is an excellent detective but perhaps her most remarkable skill is her scientific mind, capable of creating amazing devices, she has been known to make plenty of devices "just in case," especially as she grows more and more involved in supercrime. Owl Mask: The mask contains vision enhancements that allow Agent Owl to see further and in lightless conditions, while also having built in parabolic microphones to pick up more distant noises. General Equipment = Among Owl's most common tools are the body armor she wears for added protection, a grapnel gun to swing and zip to higher surfaces, and her cape, which can stiffen to form a glider. Her utility belt contains not only weapons but plenty of other more mundane tools to aid her in a vareity of tasks. Arsenal: Agent Owl's utility belt does carry an impressive arsenal. Explosives: not her favorite weapon to use but sometimes packing a punch like this is necessary. "Owl Talons": Agent Owl's compact boomerangs. Their thin profile allows her to throw a multitude of them at once, and sometimes even catch her target on its curving arc if she misses the first time, deliberately or not. "Talon" Gloves/boots: The armor plating of her costume extends to her extremities, adding extra punch to each blow. Her gloves and boots additionally conceal retractable claws, unnoticeable until revealed, useful for adding an extra element of danger (or threat) as well as a useful climbing tool. Taser Dart: The second version of her taser darts. Unfortunately to add the stronger battery the darts wound up being heavier and less aerodynamic than previous incarnations. Regardless the darts can still stick someone and send a current powerful enough to seize their muscles. Bolos: The cables weighted on either end don't fly as far as she'd like, but the added weight helps entangle her targets more easily. Smoke bomb: Creating a cloud of smoke to hide whatever is on the within it or on the other side of the cloud allows for quick getaways. Sleep Gas: These pellets can release a cloud capable of rendering targets asleep. Owl Nest: Hidden in cliffs overlooking the bay and connected to her family manor, The Nest is the base of operations where she makes her equipment, keeps her vehicles, monitors communications, and more. It and her home is helpfully maintained by Mina's loyal staff that had been with her since her childhood. Vehicles: Agent Owl keeps a number of vehicles for different situations, all of her own design. All of them are able to be controlled remotely, or use their advanced computer systems to retreat to another location when not in use (though for situations outside of basic piloting/driving Agent Owl must take direct control of the vehicles). Screech Owl: A jet that Agent Owl primarily uses to get somewhere FAST. Owlmobile: This car is Owl's go-to vehicle for when one of the vehicles is needed for direct intervention, as its more heavily armored than the others and its caltrops can disable other vehicles with little fuss. Owlcycle: Sometimes the Owlmobile is just too big, luckily she has the Owlcycle for those situations, lighter and easier to maneuver than the Owlmobile though less well-protected than the car. AquaOwl: The most seldom-used vehicle is the Submersible AquaOwl, still the waterways aren't completely free from crime either, so and if she needs to be out there for extended periods of time this submersible comes in handy. Motivation - Justice: Agent Owl has vowed to bring justice to those who deserve it, to punish the guilty and to protect the innocent. Relationship: Many of the Morgan family staff has helped raise Mina since she was a girl bereft of her parents, they're basically the only family she has and is very protective of them. Secret Identity: Mina Morgan, investor and inventor. Honor: Though she has no problem injuring criminals, she has vowed to herself never to kill them. Reputation: Though she has some allies in law enforcement, ordinary citizens are often unnerved by Agent Owl's reputation and the uncanny appearance of her costume. Martin and Tina Morgan and their eight-year old daughter Mina were out Christmas shopping one lightly snowing evening, however what the Morgans hoped would be a wonderful Christmas would instead become a terrible tragedy that would haunt young Mina for the rest of her life, as a gang war erupted while they were driving home. The car was struck by a molotov, causing the car to crash into a flaming wreck! When Mina woke up from being knocked unconscious the first thing she saw was her still buckled mother dead in her seat, and the second thing she saw was her father laying on the pavement in a puddle of blood. Having no close relatives the young girl stayed in the family home under the care of the family's trusted staff. The next few years would be nearly joyless for the young girl, as the city her parents loved fell into the clutches of organized crime. Eventually she declared no more, and dedicated herself to her education and training to be what this city needs, for organized crime to lose its grip over it. 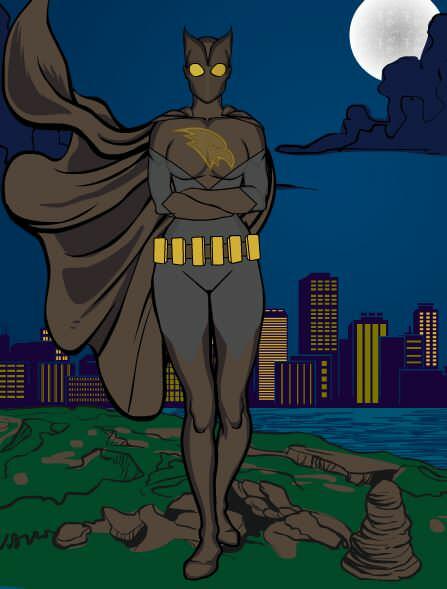 Mina would become as a hunter of the night, a dread silhouette to make criminals think twice, and so once she was ready, Mina donned identity of Agent Owl. Last edited by Nintendogeek01; 07-27-2017 at 02:09 PM. And now for what will be the only male of this bunch just as Wonder Woman is the only female founder of the Justice League. Wonder Woman, of the big three covered thus far in this topic here she is; back in her intro-days of the Golden Age she was a REMARKABLY progressive character. Be honest people, how many other stories from the 40's can you think of where it's the man in danger and the woman comes to his rescue? Sadly despite being billed as one of DC's big three she's been comparatively shafted as far as top billing goes; as an example, of the big three she's the only one who never got an "All-Star" story published (hard to say if that specific example is a good or bad thing though. 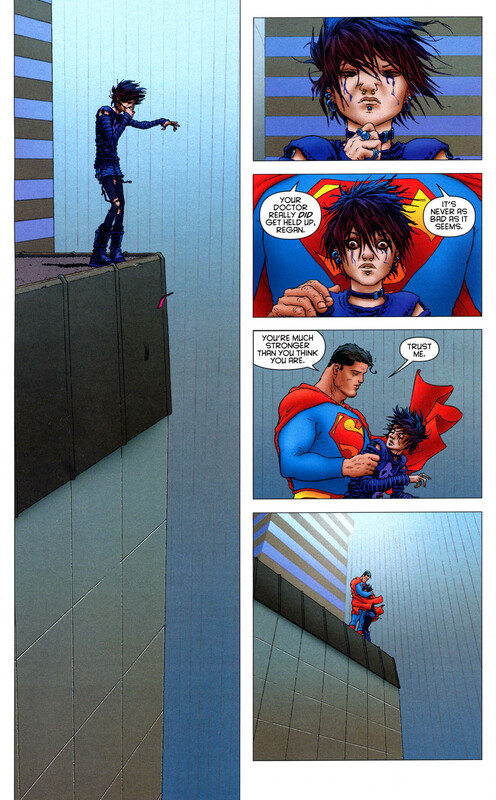 After all, All-Star Superman may have been one of the best Superman stories of all time, while All-Star Batman makes one wish to claw out one's eyes). Still Wonder Woman remains a very progressive symbol, she is both figuratively and literally a powerful woman who is venturing into what is largely a man's world and making a lasting impact through both incredible strength and incredible compassion! Hilt of Avalon: [Magic Device] [Blunt/slash/pierce] The Hilt of Avalon is a mystical weapon granted to all Knights of Avalon which they train with for the day that they follow King Arthur during England's greatest need. A hilt of Avalon uses magical energy to create a projection of any weapon the wielder envisions. Wonder Knight uses the hilt to form lighter weapons that he can use for quick precise strikes and defense as well as offense, or larger weapons that are more cumbersome to use but mightier. However his preferred weapon to create from the hilt is a flail which can extend incredible lengths and wrap around targets, entangling them in the same fluid motion he first lashes out with. 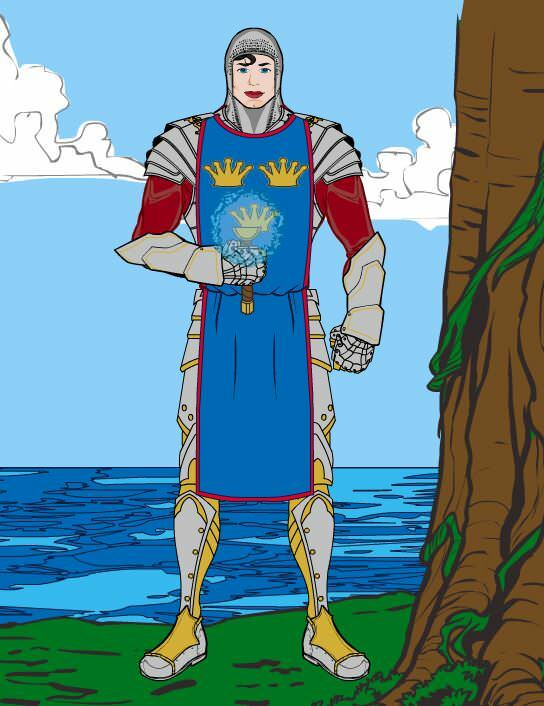 Avalonian Immunities: [Physical] Growing up in Avalon has gifted Wonder Knight, not only with his incredible strength, but also with certain immunities. Armor of Avalon: [Magical Device] The Armor supplements Wonder Knight's own natural toughness by allowing him to completely ignore lesser blows, it also is able to transform into any civilian appearance that Wonder Knight wishes. Magic Steed: [Magic] [Horse] [Movement] [Flight] Wonder Knight uses a spell to summon his horse from its pasture in Avalon, the faithful steed is capable of magical flight and carries his master through the air at incredible speeds. If the steed is attacked and sufficiently injured the spell automatically recalls it to Avalon where his injuries are magically treated once more. alt; Strong Legs: Though not near as fast as his mount, Wonder Knight's powerful legs let him run faster and jump further than a normal human being. Motivation - Responsibility: Believes that his power and training must be used to defend the helpless. Responsibility: As a Knight of Avalon he is beholden to King Arthur. Secret Identity: When looking to keep low to the world at large he adopts the name of Aaron Anderson. Honor: Follows the code of Chivalry. Secret: Only his closest allies know that he hails from Avalon, and he keeps it a strict secret. When World War II broke out King Arthur and his knights within Avalon considered coming to Britain's aid, eventually however the king decided that this was not the hour of need that he was destined for. One young squire, Aurelius, disagreed and against all protest rode out into the world. He adopted the identity of Wonder Squire and battled Axis superhumans using his training and with the help of other superheroes. Eventually the war ended and he returned to Avalon. King Arthur applauded the boy's bravery, but he still disobeyed a direct order from the king, as such he was punished with a much longer stint as a squire before he was allowed knighthood. The world has changed considerably in the decades however, and things are uncertain. Sir Aurelius implored King Arthur to allow him, who had some experience with the outside world, to leave Avalon and monitor the world at large. Though hesitant, King Arthur eventually acquiesced to his wishes and allowed Sir Aurelius, now known as the Wonder Knight, to safeguard the world and monitor it. Last edited by Nintendogeek01; 07-27-2017 at 02:10 PM.